Is there something you could cut back on? Are there dollars you could move from one unnecessary line item of your budget to something that’s more critical? For us, two massive things that have helped have been cutting our cable and getting new cell phone plans. Oh, and I’m not above being cliche: cut the lattes. Or whatever other little indulgences are slowly gnawing away at your cash flow. Over the years there have been times when our budget was cut, but we still needed cash now. There are things you can do to pick up extra money in a hurry. They’re not always huge income earners, and they may not be consistent or sustainable long-term, but they will get the job done in a pinch. Things I’ve done have been selling some of my stuff on eBay or Craigslist, participating in medical/psychological studies (usually they’ll pay you for just the interview part and you still have the option to opt out if the full study isn’t a great match for you,) and mystery shopping. 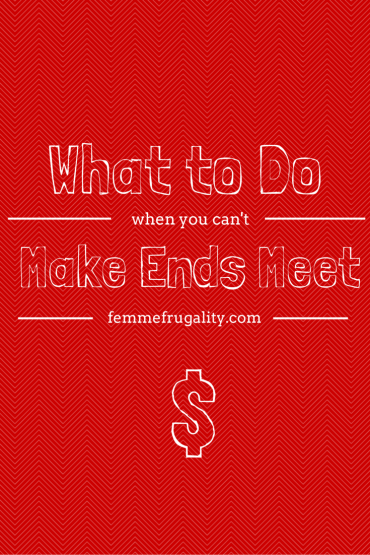 Sometimes saving on or cutting those monthly luxuries just isn’t enough. And those fast cash techniques can eat up a lot of time without actually building on themselves. If you need something sustainable to boost your income, build something for yourself. For me, it’s been blogging and freelance hustling. I’ve been at it for three and a half years, and the first years were not particularly profitable. But I’ve gotten to a point now where I feel like I’m being compensated almost fairly for my time, and the extra income is helping us reach our goals, not just our survival needs. The time on the front end of building anything is insane, and usually the compensation is minimal. But if you stick with it you may just have created something amazing for yourself a few years down the road. Education has been huge for us. It’s something that’s always been important to me, but seemed unobtainable due to the fact that I absolutely refused to take out student loans. Odds are that if you’ve cut everything, have tried hustling, and still can’t make ends meet, your income is low enough that you can go to school for free. Yes, free. Maybe even get paid for it. Apply for grants. Apply for scholarships. Work hard for the best grades you can get. Pick a major that is applicable to industries that actually pay money to the people that work in them. And come out the other side an income-earning machine. It’s hard work. But if done properly, it’s completely worth it. Are there any ideas that I’ve missed? Leave them in the comments below! Visualize Your Goals. Slay Your Goals. 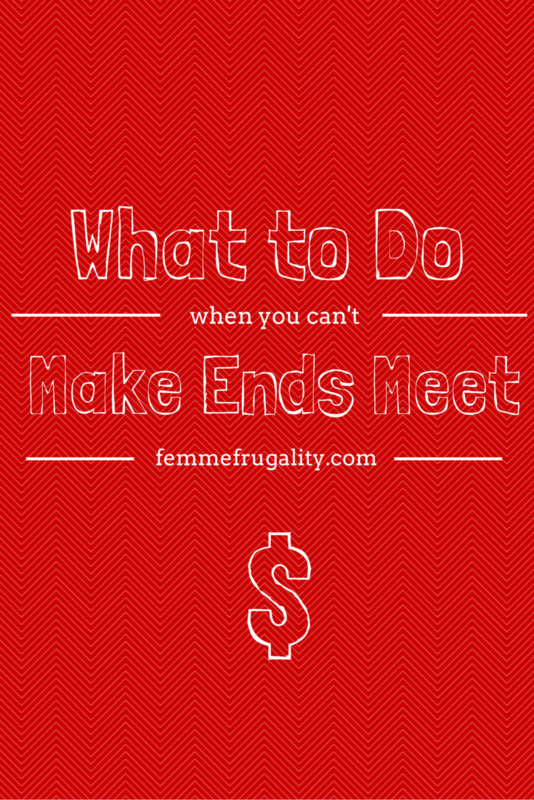 This entry was posted in Money Management on January 21, 2015 by femmefrugality. I think you’ve covered great ones here. Hopefully when you’re on a budget your ends will meet. But for those rough patches, knowing how to cut back temporarily really helps. Absolutely. And getting creative and increasing income certainly helps a good deal, too. I don’t miss the days of the “Get Cash Fast” phase, but I’m sure glad those mini hustles were there. Rough patches come and go through our lives, through all different aspects of it, including financial. Edumacation ftw! At least, if it is in a reasonable field. Acknowledging that the slow fix is generally the best one, that will keep you out of trouble, is tough but necessary. And yay for slow fixes! They can be frustrating at first but can also end up being totally worth it long-term. The fast cash money is a step I see so few people take on, even when things are dire. I feel like it’s a litmus test: let’s see if you’re willing to hustle a little, right now, to address your financial problems. If you can’t part with your old junk and a few hours to get a few hundred bucks, then you’re not really ready to deal with the issue. I also feel like negotiating for raises is another item few people have the guts to try. Annual reviews are a built-in discussion for whether you’re being compensated properly. Yes, it’s uncomfortable. Here’s a secret: it’s also uncomfortable for your boss. I feel the same way about fast cash, but I totally don’t get it. Maybe I just get too dramatic about not paying the bills. But the crazy part of me thinks that other people just aren’t dramatic enough. And yes!!!! Negotiating for raises!!! I knew I was forgetting something major! Good luck on yours soon! I’m routing for you! This is the main reason I haven’t quit my FT job yet, I’m afraid of a month where the ends won’t meet. Sigh! I need a bigger emergency fund first I guess. 99% sure that’s Michelle from Making Sense of Cents. I think you’re being smart, by the way. #1 goes a long way. I’ve been amazed at the fact that I’ve been able to cut back . . . and then cut back some more. I’m really seeing the whole “build your frugality muscle” principle at work. What seems radically frugal in the beginning eventually becomes normal. Agreed. We had a really hard time deciding to cut cable. But now it’s not a part of our life and we can’t believe we used to spend $1k+/year on it! The government normally has special programs for people who are struggling. There are some people who feel they are too proud to take a handout from the government. I do believe with prayer and a will to survive, people can live through some really hard days and arrive above their adversity. I have seen it in the past. Yes. And I’d argue that if you’re trying your best and qualify, you should enroll. That’s a part of the grants for school. That’s getting food on your table so you and your family can survive. That’s practicing humility so that you are capable of contributing more tomorrow. I’d generally say: consider whether moving might be financially beneficial for you. E.g. if you live in an economically depressed town or a city with a high COL, location may be the difference between living well or living on the edge. Obviously, this sort of thing is harder for some people, like those with families or other roots, than others. I agree! Luckily I live in one of the most affordable cities in the country, so that part hadn’t factored into my own equation, but if you’re coming from somewhere else I can totally see how it could. You’re right, though, having a family changes things. There are school districts and safety to consider. We could save a ton if we moved to a dangerous neighborhood, but it’s not something I’m willing to do mostly because of my kids.